From a cleaning, to a small filling, to a full smile makeover and everything in between – TEAM PAWL is here to educate you, guide you, and see you through your dental care…no matter how big or how small. Your goals are our goals!! Our approach is simple – provide the highest quality care, from a dental team you know and trust, in an environment that is comforting and inviting. Don’t just take our word for it; Check out what our very own patients are saying about TEAM PAWL and their dental experiences in our office. 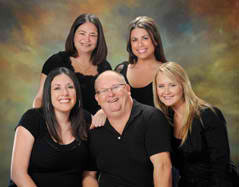 If you don’t feel the same about your current dental experience, we’d love for you to be a part of our dental family!! The Sapphire Plus Lesion Detection system is a diagnostic scope which uses a high intensity light to illuminate your mouth to determine if any tissue abnormalities exist. See more. Our laser treatment can bring immediate relief and faster healing. Don’t suffer any longer. Quicker recovery times, less discomfort, amazing results – all of this is possible with laser dentistry. As a highly motivated team, we will maintain a caring, secure and enjoyable work environment. We are commited to continuing to improve by always encouraging each other to grow personally and professionally. We will provide each patient with thorough, personalized care in a timely, consistent manner. Our ultimate goal is to inspire our patients to obtain and maintain a lifetime of optimal dental health. We are excited to be trusted as our patients’ dental healthcare provider and will exceed all their expectations!